Tuesday's News On The Disaster In Japan : The Two-Way Tuesday's latest news on the disaster in Japan, where there's been another explosion and fire at the nuclear power plant in Fukushima. 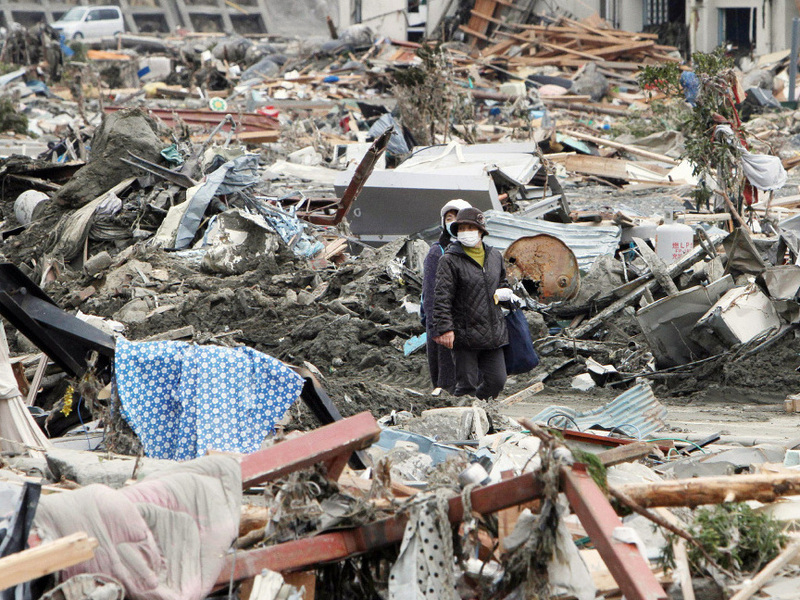 People walked through rubble in Minami-Sanrikucho, Miyagi prefecture, earlier today (March 15, 2011). 7:15 p.m. ET: The search for survivors continues. The death toll and estimates of how many people are missing continue to rise. And the race to bring three nuclear reactors under control at a power plant in Fukushima has the world watching anxiously. In this post, we followed Tuesday's developments about the crisis in Japan, where a 9.0 magnitude earthquake set off devastating tsunamis on Friday. Scroll through to see what happened today. -- The NPR.org "Crisis in Japan" story page. -- The "Tohoku-Kanto Earthquake" news page from The Japan Times. -- The live stream of NHK's English-language broadcast. -- StoryFulPro's curated Twitter list. -- The Twitter list being curated by NPR's Wright Bryan. Between 50 and 70 employees – now known in English as the Fukushima 50 – all in protective gear, were left at the plant to battle myriad problems. Some are assessing the damage and radiation levels caused by the explosions, while others cool stricken reactors with seawater to try to avert a potentially catastrophic release of radiation. The workers are the nuclear power industry's equivalent of frontline soldiers, exposing themselves to considerable risks while 80 of their evacuated colleagues watch from a safe distance. Fifteen people on the site, including members of the self-defence force, have been injured in the blasts. Noriyuki Shikata, the Japanese prime minister's director of global communications, reported on Twitter that a fire has broken out at the No. 4 reactor. NHK, Japan's state broadcaster, reported that attempts to put out the fire had not started because the previous one had been gone out "naturally." They add that the area is filled with high levels of radiation, so reaching it is complicated. The AP, however, reports that Tokyo Electric Power Company says that the new fire "erupted because first one was not extinguished." During a press conference, nuclear safety officials said that two workers had gone missing, after the explosion at the No. 4 reactor. The Australian reports the workers were in the turbine area. Reuters reports that officials also said the roof of that reactor appeared to be cracked. The BBC reports that "500 bone marrow transplant centers across Europe are being asked to be on standby to treat Japanese radiation victims if the need arises." Japan's Kyodo News is keeping track of the status of the Fukushima Daiichi nuclear power plant's reactors here. There's an Associated Press interactive graphic and video here that explains in some detail what is happening at the crippled Fukushima Daiichi nuclear power plant where engineers are trying to cool three reactors. The Japan Times writes that Japan's National Police Agency says "3,373 people were confirmed dead and 6,746 were missing as of 8 p.m. [local time]. But with many unidentified bodies turning up in quake-hit coastal areas, the death toll was expected to jump further." From Koriyama City, Japan, which is about 40 miles from the crippled nuclear power plant where engineers are trying to cool three reactors that have overheated and some radiation has been detected in the air, Doualy Xaykaothao reports that cars stretch "beyond the horizon" as residents ignore the government's advice to stay inside. The people she's spoken to, Doualy says, "think that the government is trying to cover up something." The Associated Press reports that "more U.S. military crews are being exposed to radiation as they press ahead with relief flights over Japan. And the Navy said Tuesday that it is sending some ships to operate off the country's west coast rather than east coast. That's to avoid hazards from the huge debris field left in the ocean by last week's tsunami and to be farther away from radiation leaking from troubled nuclear power reactors." We reported yesterday on the word that 17 helicopter crew members from the USS Ronald Reagan had been exposed to low levels of radiation. The ship's captain said the radiation was removed with soap and water. The U.S. Geological Survey says there have been 14 earthquakes of 5.0 or greater magnitude today in the sea near where Friday's massive temblor was centered. Just within the past 20 minutes, there was a 6.0-magnitude quake. The USGS says there've been 13 aftershocks off Honshu, Japan today. Two of them had magnitudes of 6 or stronger. Journalist Chie Matsumoto tells us about emergency workers in one Japanese city who apparently lost their lives because they stayed behind to warn others of the approaching tsunami. An "explosion that occurred ... at the Fukushima Daiichi unit 2 may have affected the integrity of its primary containment vessel," the International Atomic Energy Agency says in its latest update on the crisis and the damage to Japan's nuclear power plants, and particularly the crippled Fukushima Daiichi facility. As NPR's Richard Knox reported earlier, Japanese authorities have also said that damage to unit 2 "probably has caused a breach in the heavy containment vessel, called a suppression pool or torus. That potentially allows radioactive steam or water to escape from a new route." Reminder: While radiation levels at the plant's main gate spiked earlier today, later readings showed much lower levels. Update at 10:40 a.m. ET. U.S. Navy Detects Low Radiation: The Navy's Pacific Fleet says the USS George Washington detected low levels of radioactivity from the Fukushima plant. The carrier is stationed in Yokosuka and the Navy says while there is no danger to the public, military personnel and their families should take precautionary steps and limit outdoor activity and secure external ventilation systems. The statement adds: "We do not expect that any United States Federal radiation exposure limits will be exceeded even if no precautionary measures are taken." Stocks are taking a big hit on Wall Street this morning as investors react to what's happening in Japan, home to one of the world's most important economies and supplier of many of the computer chips and other products that go into so many manufactured goods. The Dow Jones industrial average is down about 260 points, or 2.2 percent. There's been a 5.8 magnitude temblor off the east coast of Japan near Honshu within the past 30 minutes, the U.S. Geological Survey says. Reuters describes it as "one of the most powerful aftershocks to hit the country since Friday's devastating earthquake and tsunami" and says that buildings swayed in Tokyo, a couple hundred miles away. Reporter Doualy Xaykaothao alerted NPR that it felt like "a roller coaster ride" for a few seconds. She's close to where Friday's quake happened. "Despite the deteriorating nuclear emergency,humanitarian operations continue unaffected," the United Nations Office for the Coordination of Humanitarian Affairs reports in its latest "situation report" on the crisis. -- "Nearly 416,300 people have been evacuated from the earthquake and tsunami affected provinces, half of which are from Miyagi (203,953 people). Others are from Fukushima (131,665 people), Iwate(46,405 people), Ibaraki (22,595 people), Tochigi(9,530) and Aomori (2,143 people)." -- "The main humanitarian needs continue to be food, drinking water, blankets, latrines, fuel and medical items which the Government and private sector in Japan are urgently mobilizing to the affected areas. More than a quarter of the planned food delivery has now reached the affected areas (more than 550,140 meals of bread, instant noodles and rice balls). Nearly 119,000 water bottles, 117,000 blankets and 130 latrines and 288,000 litres of fuel have been transported as well." We posted yesterday about the InterAction.org list of aid groups who are working to help people in Japan, and links to where donations can be made. InterAction has added six more groups to its list. Update at 8:35 a.m. ET. Radiation Levels Dropping: The International Atomic Energy Agency says radiation levels at the Fukushimia Daiishi plant have dropped. Over a six hour period, they fell from 11.9 millisievers per hour to 0.6 millsievers per hour. The IAEA says "Since one sievert is a large quantity, radiation doses are typically expressed in millisievert or microsievert, which is one-thousandth or one millionth of a sievert. For example, one chest X-ray will give about 0.1 mSv of radiation dose." To compare, the IAEA got an earlier report from Fukushima of a level of 400 millisieverts per hour. It's a huge dose, but the agency says it is a 'local value at a single location and at a certain point in time.' Japan tells the IAEA 150 people have been checked for radiation and 23 people have needed decontamination. As we reported earlier, 50 people are said to be at the crippled nuclear power plant in Fukushima fighting to cool the reactors and prevent more explosions. The New York Times writes about how "radiation exposure could curtail [those] workers' efforts." "People who are working close to the reactor — pumping water, or operating valves inside the secondary containment structure — would almost certainly be wearing full bodysuits and air packs, [Arnold Gundersen, a consultant who worked in American nuclear plants] said. But some forms of radiation can penetrate any gear." Update at 8:15 a.m. ET. Radiation Fears: On Morning Edition a few moments ago, NPR science correspondent Richard Harris reported from Tokyo that while the situation at the crippled nuclear power plant in Fukushima is extremely serious, it's still "probably not as bad as Chernobyl" — a reference to the 1986 disaster at a nuclear plant in the former Soviet Union. The blast at the Chernobyl plant sent huge amounts of radiation into the atmosphere. So far, the signs are that's not likely to happen in Japan because of better containment systems at the site. Still, as Richard reported, the levels of radiation detected earlier today at the Fukushima plant are at a level which "over an number of hours" would lead to radiation sickness and "over a day could be lethal." "You do not want to be in an area like that," Richard added. As he pointed out, while workers and residents have been evacuated from the area around the plant, 50 people have stayed behind to "tend to the emergency" and continue trying to cool down the nuclear reactors. "BREAKING NEWS: More than 10,000 dead or unaccounted for in mega quake." It cites the Japanese government as its source. Update at 7:50 a.m. ET. Iodine Tablets: For an explanation of "why iodine tablets come out when radiation threatens," see this post by NPR's Scott Hensley over at the Shots blog. It's a subject at the top of the news because, as was reported earlier, "dangerous levels of radiation are leaking from the earthquake-crippled Fukushima Daiichi nuclear power plant north of Tokyo and levels are rising, Japanese Chief Cabinet Secretary Yukio Edano said Tuesday." Scott writes that "iodine tablets can prevent the absorption of radioactive iodine for up to 24 hours, according to the Centers for Disease Control and Prevention. The amount of iodine you can get from iodized salt or your regular diet isn't enough to protect you." "The USGS has updated the magnitude of the March 11, 2011, Tohoku earthquake in northern Honshu, Japan, to 9.0 from the previous estimate of 8.9. Independently, Japanese seismologists have also updated their estimate of the earthquake's magnitude to 9.0. This magnitude places the earthquake as the fourth largest in the world since 1900 and the largest in Japan since modern instrumental recordings began 130 years ago." There have been two ominous developments Tuesday at Japan's Fukushima Daiima nuclear complex: another explosion and a separate fire. That makes three explosions at the troubled facility. The first blasts were on Saturday and Monday. NPR's Dan Charles tells NPR Newscasts the latest explosion occurred at the Number Two reactor and could have damaged the radioactive core. Radiation levels began to rise. Then, a fire broke out at the building that houses the Number Four reactor, which is offline. It houses spent nuclear fuel and Dan notes large amounts of radiation were released from there. In a piece of good news, Reuters cites the World Meteorological Organization says winds are dispersing radioactive material eastward, out of Japan and over the Pacific Ocean. News has been slow to emerge about the nuclear crisis and even the Japanese government hasn't been getting timely updates. Kyodo news agency reports Japanese Prime Minister Naoto Kan said to Tokyo Electric Power Company, "what the hell's going on?" Kyodo also says the number of missing and dead from Friday's earthquake and tsunami has risen to 6,000.